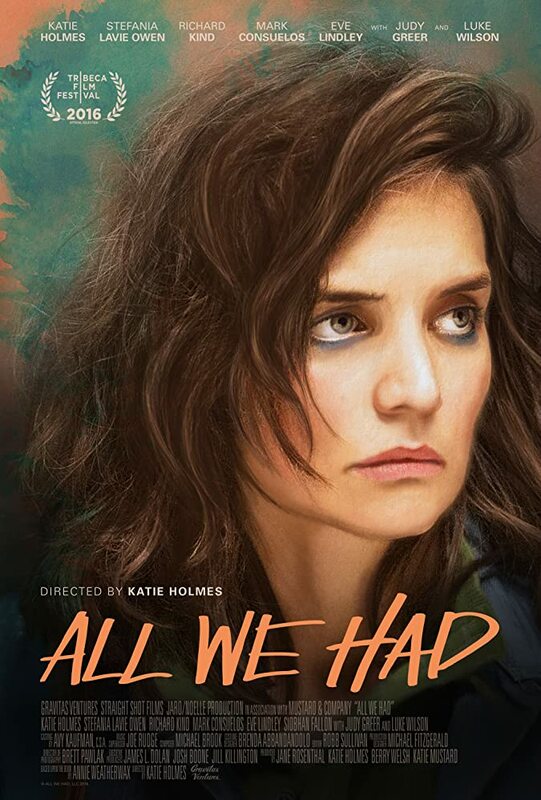 “All We Had,” the directorial debut of actor Katie Holmes, opens with a mother attempting to remove a tooth by rigging a piece of string to the ceiling while her daughter holds her steady atop a toilet. “You’re going to have to push me,” says the mother, Rita (Holmes). It sets the tone for a film about two characters whose scrappy lives are characterised by on-the-fly, makeshift solutions to life’s problems, and by their dependence on each other. 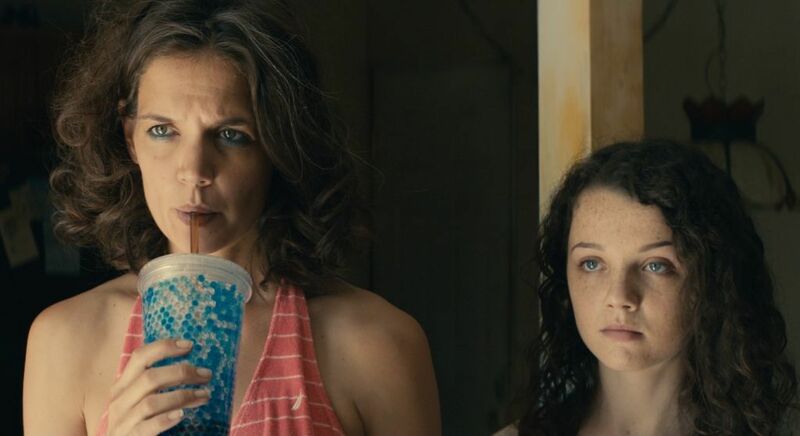 It is the daughter, who convinces her mother to bolt flee from her (presumably) abusive boyfriend in a momentary decision that sets the two of them on the open road in search of a new life. After the tooth-pulling incident, the daughter, Ruthie (Stefania Owen), is sent to shoplift painkillers from a convenience store. The way she pulls up her hood as if donning a superhero costume to commit petty crimes is almost comical were it not so sadly indicative of their situation. In these moments, she is thinking only about how to get through an immediate problem to keep herself and her mother moving forward. To where? Boston is the destination they’ve chosen, though it becomes increasingly clear they’ll never get there. Pam (Eve Lindley), a transgender waitress they meet later, has aspirations of becoming a YouTube star and move to New York, even though it’s clear to the viewer that is unlikely to happen. “This is my year,” Pam says. Dreams are important, even if all they do is push us to keep moving. The film is almost entirely populated by desperate people on the fringes, living under a damoclean threat of economic despair, and all making choices — some bad, but arguably necessary — to survive. But Ruthie and Rita are only able to see these people when they are forced to stay in one place long enough to see the cost of their actions. “These people will survive no matter what we do,” Rita tells her daughter in response to her guilt about a planned dine-and-dash. But when their getaway car breaks down in the parking lot, they have to walk back into the diner and confess. “My uncle has a heart condition,” Pam scolds them. “You could have killed him.” Everyone’s survival is precarious, and Rita’s assumption otherwise is particularly ironic given the relationship that develops between these characters later in the film. “All We Had” is a rough film, particularly in the script department. It is episodic and sort of aimless around the middle, and plagued by uneccesary voiceover and some obvious dialogue. But it’s also a film that reaffirms Holmes as a performer and shows promise for her work as a director. She’s no grand visual stylist, but she wisely keeps the camera focused on the actors, who are the reason the film works. Young Stefania Owen is particularly impressive. She not only looks believeably like she could be Holmes’ daughter, but plays Ruthie with simmering intensity that betrays the character’s hard-knock life experience without ever making her feel precocious. Ruthie’s love for her mother is deep, as the title suggests. When new men come into Rita’s life, Ruthie is protective. She is wary not just because she has seen the ways it has all gone wrong before, but out of fear that it could go right. Even in the best-case scenario, it will change the relationship that is all Ruthie has ever known. It’s maybe not an entirely healthy relationship, but it’s fascinating as hell, and at the core is exemplary of the small details that make “All We Had” worth checking out.